SSC JHT 2018 – Staff Selection Commission (SSC) has released the marks of Paper-I of Junior Hindi Translator, Junior Translator, Senior Hindi Translator and Hindi Pradhyapak Examination 2018 on April 16, 2019, at ssc.nic.in. The number of vacancies which will be filled during the SSC JHT 2018 recruitment process has been released. The SSC has declared the result of SSC JHT 2018 on March 22, 2019. The result has been declared for the online examination held on January 13, 2019, in the form of pdf. SSC will call the 2041 qualifiers of paper I for the skill test i.e. paper II. And the qualifiers will be issued the admit card for skill test which will hold on May 26, 2019. From this page, candidates will get full information regarding SSC JHT 2018. Latest: The SSC JHT Result 2018 marks has been released. Click here to check the same. The selection of the candidates will be done on the basis of Paper 1 and Paper 2. The Paper I was computer-based test while Paper II will be a skill test. For more information regarding SSC JHT 2018 check the schedule given below. The SSC has announced the vacancies for the Junior Hindi Translator and Senior Hindi Translator. The candidates who are participating in the SSC JHT recruitment process conducted by the SSC. SSC JHT Result 2018 is announced by Staff Selection Commission after the cut off release. The result and cut off marks for the SSC JHT 2018 paper I has been announced at ssc.nic.in. The Result and the write-up are in the form of pdf file containing the details of the qualified candidates. Later after the conduction of paper-II, the result will be released by the SSC for paper-II. The candidate will be able to check their SSC JHT Result, 2018 from the official website at ssc.nic.in The SSC JHT Result, 2018 will be available in PDF format. The result will be available in the Result section. You do not need any credential. 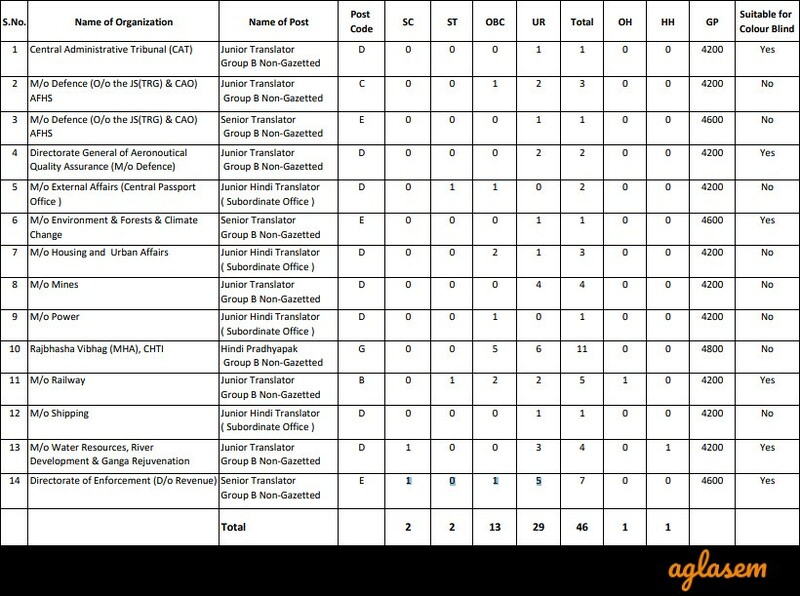 The Staff Selection Commission has released the tentative answer key of SSC JHT. at ssc.nic.in. The answer key released for the Tier I examination which was objective in nature. The direct link to check answer key has been provided above. The candidates who appeared in the exam can chcek the answer key of the SSC JHT Paper – I. The candidates should note that SSC will not release the answer key for paper -II, because it is the conventional type. Through the answer key candidates can estimate there marks in the exam prior to the declaration of result. SSC JHT Admit Card for paper II was made available at the official website at SSC at ssc.nic.in. For downloading the admit card the candidates will need to enter the login credentials. The candidates required to carry their SSC JHT 2018 Admit Card on the day of the examination. For all the candidates it is mandatory to carry their admit card on the day of the examination. The admit card for paper 1 has been released. There are two phases in the selection procedure paper I & II. The paper will contain two passages for translation-one passage for translation from Hindi to English and one passage for translation from English to Hindi, and an Essay each in Hindi and English, to test the candidates’ translation skills and their ability to write as well as comprehend the two languages correctly, precisely and effectively. The level of the paper will be consistent with the educational qualifications prescribed. Age Limit – The candidate must not be older than 30 years in age as on 01 January 2019. 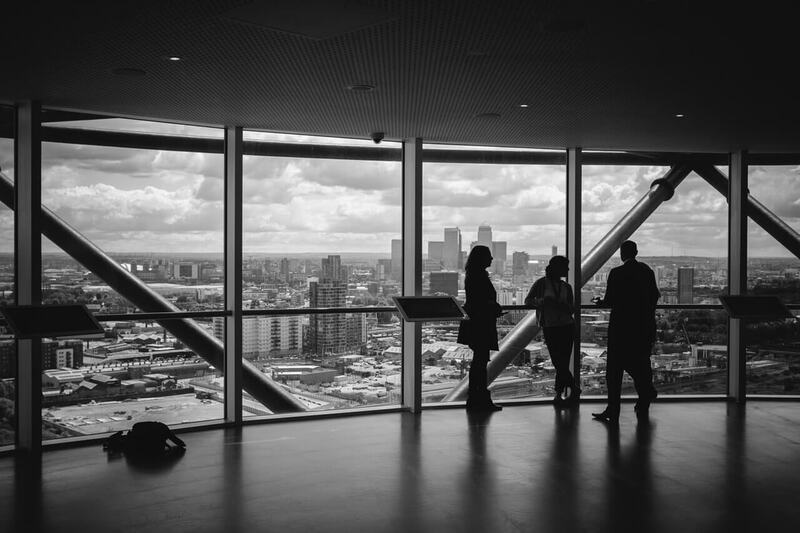 Educational Qualification – Candidates should have Bachelor or Master Degree in various stream. Selection Process – The Candidates will be shortlisted on the basis of their performance in both the papers Paper-I & Paper-II. Application Fee – Rs. 100/- (Rupees one hundred only). How to Apply – Applications must be submitted only in the online mode. The Staff Selection Commission (SSC) released the application form on its official website ssc.nic.in. The candidates filled the application form after checking the eligibility criteria. Only eligible candidates should fill the application form, the rest should not. The commission will cancel the form submitted by an ineligible candidate. The candidates have to submit the Rs. 100/- except for Woman, SC/ST, OBC, and Ex-Serviceman. There are two modes for submitting the fee last year. Bachelor’s degree in Hindi with English as one of the subject at degree level either as compulsory or optional from a recognized University or Institute plus Master’s degree in any subject from a recognized University or Institute plus Bachelor of Education from a recognized University/Institute. Bachelor’s degree in any subject from a recognized University or Institute plus Master’s degree in Hindi with English as one of the subjects at degree level either as compulsory or optional from a recognized University or Institute plus Bachelor of Education from a recognized University/Institute. The selection of the candidates is purely based on their performance in the exam. There will be two stages in the selection process of SSC JHT 2018. Firstly the candidates have to appear for the paper – I, they have to obtain the minimum qualifying marks in the exam. Those who will obtain minimum qualifying marks or more than that, they will be treated as qualified for paper – II. 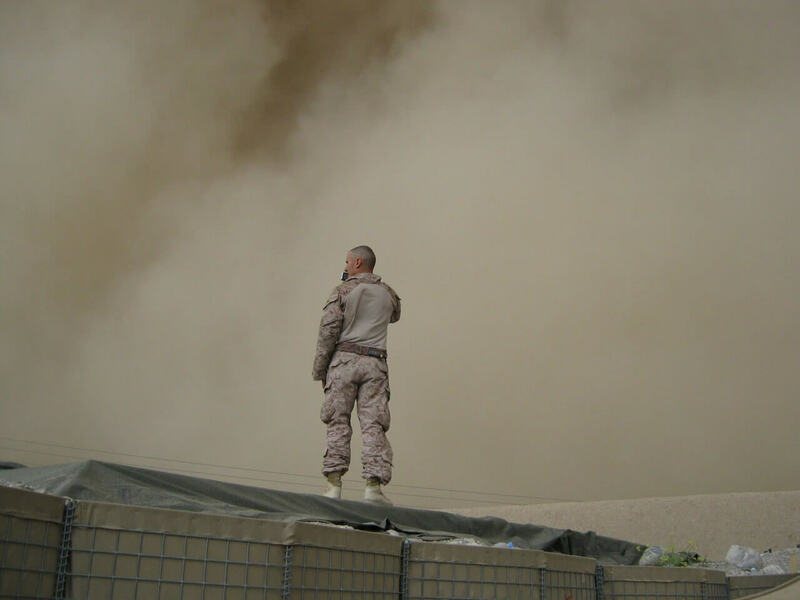 Later the qualifiers of paper-I have to appear in the paper – II. At last a merit list will be prepared for the combined marks of paper – I & II. 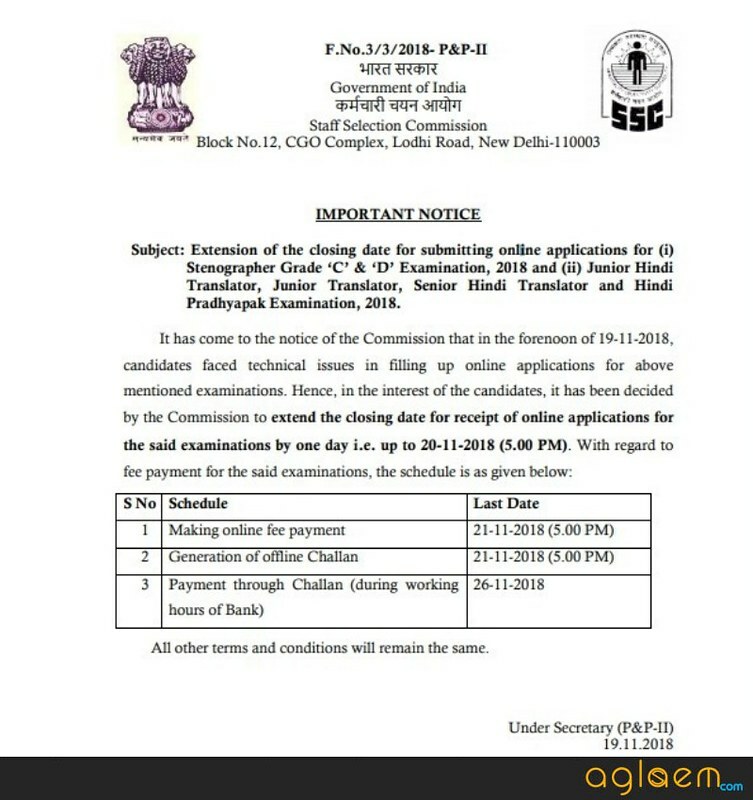 Staff Selection Commission will release SSC JHT Notification 2018 tentatively on 1st September 2018. 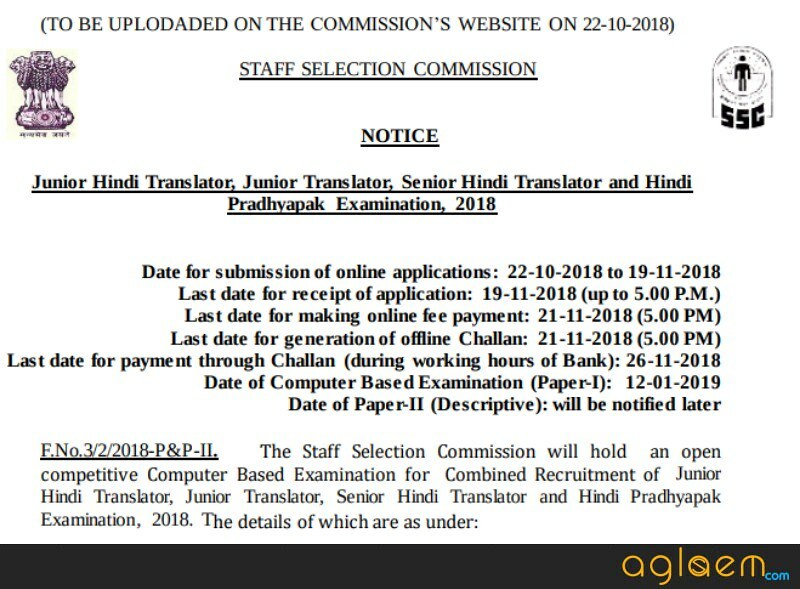 Through SSC JHT Recruitment 2018 candidates can apply for posts of Junior Translators, Junior Hindi Translators, Senior Hindi Translator and Hindi Pradhyapak.